After many years of hard work, Grassroots Powdersurfing is proud to release the world’s first full length film featuring true binding-free powdersurfing. View the entire full length documentary and the trailer below for free or click here to purchase a digital copy from Vimeo. Physical copies available for purchase on DVD and BluRay at our webstore. White Waves explores the history, contemporary and future of true binding-free powdersurfing from an insider’s perspective. See how this unique blend of surfing, skateboarding and snowboarding has emerged from the hearts, hands and minds of a few pioneers who are paving the way into the future by nodding to the past and re-approaching the way they interact with mountains. Take a ride in the shoes of the most experienced shapers and riders in the powsurfing world and learn more about the pursuit of what they feel is one of the most incredible feelings on earth. 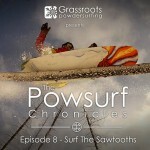 This film features true binding-free powdersurfing; there were no straps, ropes, sky-hooks, magnets, or any other type of binding used for the riding in this film. Starring: Jeremy Jensen, Terje Haakonsen, DCP, Ian Provo, Neil Provo, Scotty Arnold, Atsushi Gomyo, Tasuku TSK, Mads Jonsson, Al Clark, Craig Stevenson, Brock Bitton, Cody Townsend, Rob Patterson, Howard Sorenson, Kanika Koh, Dave Smellie, Rob Stevens, and Josh Serna.